PLEASE NOTE: Images appear blurrier on this page than in real life. 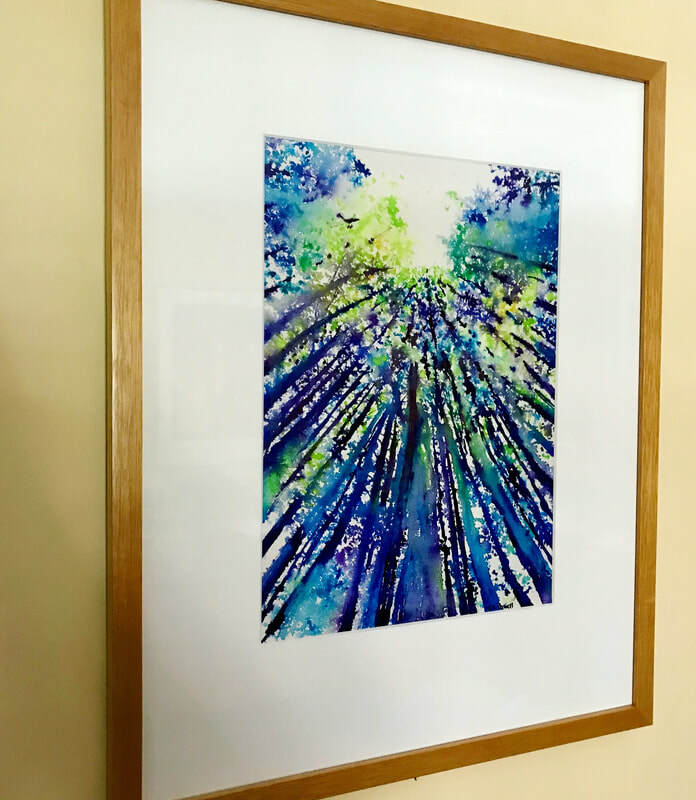 If you like a painting but you aren't sure about the crispness, please contact me and I will send you Higher Resolution jpegs. HOVER OVER IMAGE FOR PRICING AND SIZING. Sunflower series, #9 Watercolor 9.75"x10" includes 3" Mat $250. Sunflower series, #10 Watercolor 10.875"x10.125" $250. Sunflower series, #11 Watercolor 11 1/4"x10 1/8" $250. Pine Tree series, #2 Watercolor 12"x9" $250. 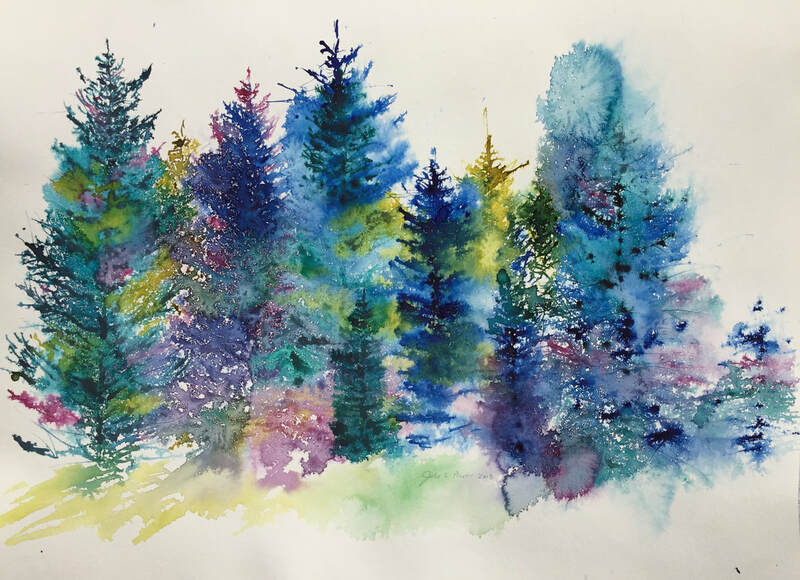 Pine Tree series, #3 Watercolor 15"x11" $250. 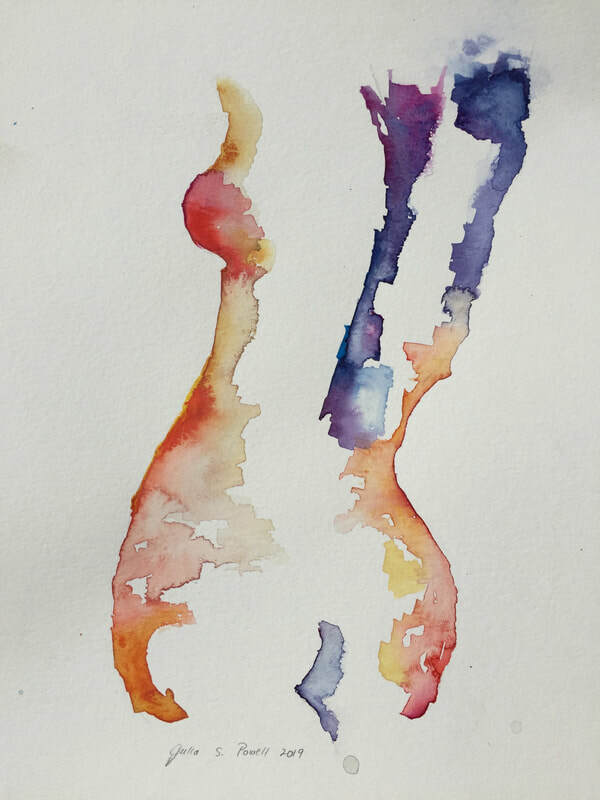 Looking Up series, 2019 #1 Watercolor 14.125"x10.25" $250. 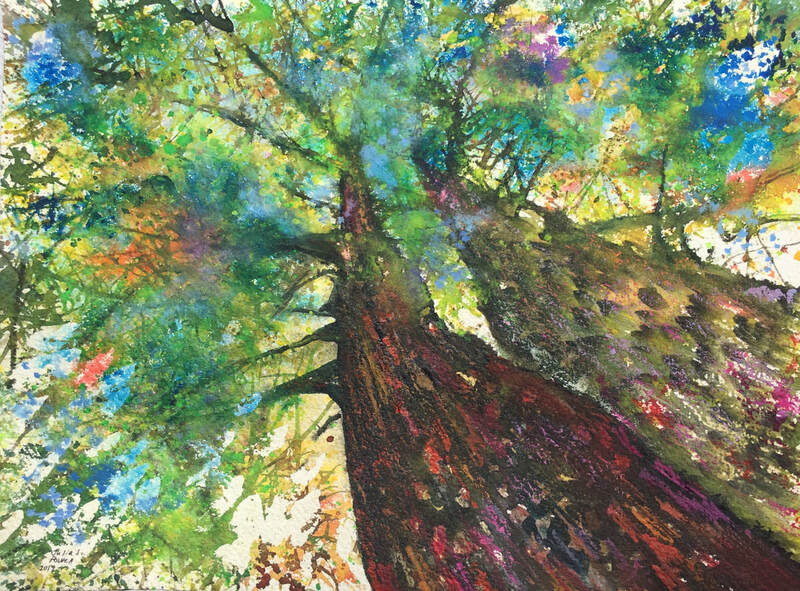 Looking Up, Solo Tree, 2018 Watercolor 10 5/16"x12 3/16" $250. 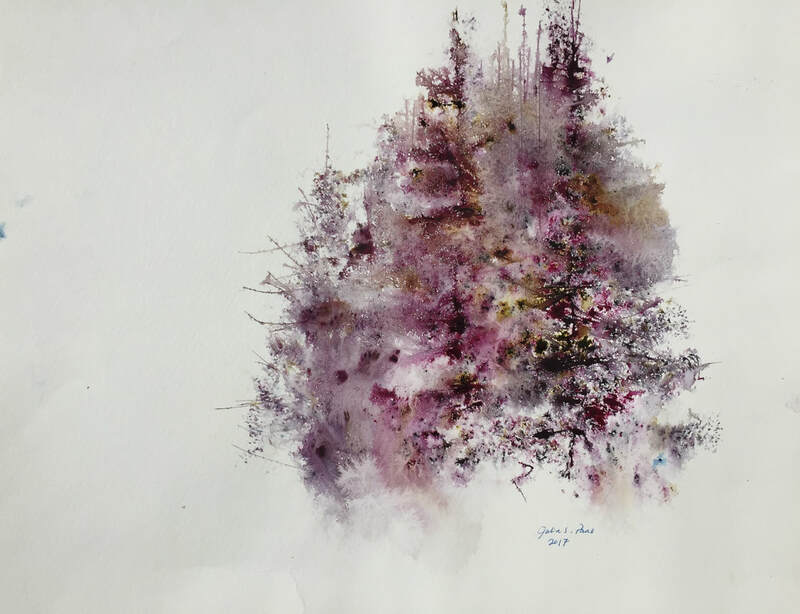 Looking Up series, Single Tree Watercolor 16"x12.125" $250. Birches series, 2017 Watercolor 12 3/4"X10 5/16" $250. 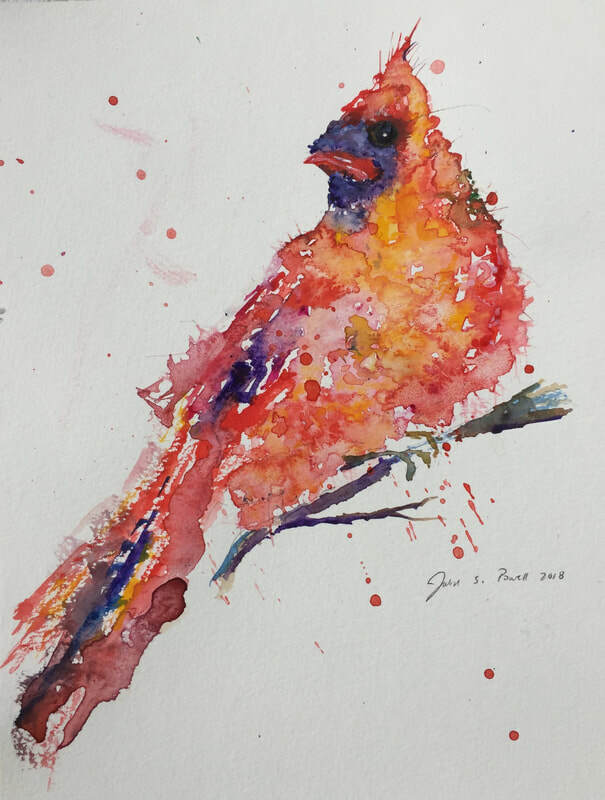 Owl in Watercolor Print Run of 3 15"x11.125" $125. Touch of Yellow Watercolor 11"x15" $400. 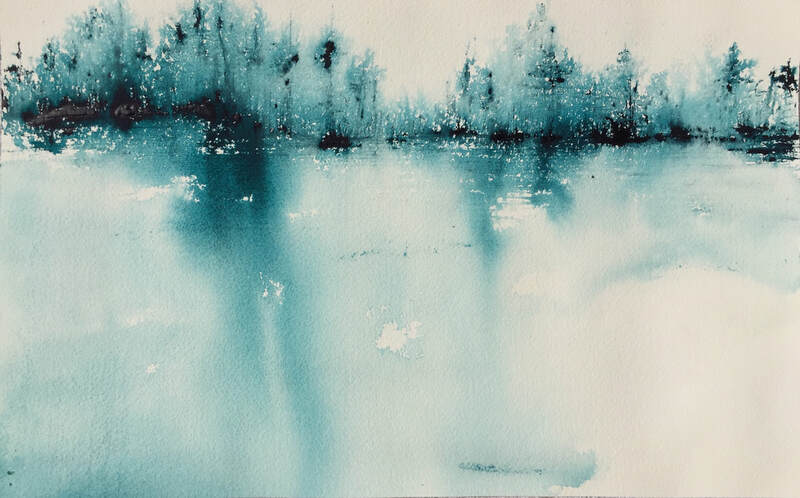 rest Study in Blue #2 Watercolor 15"x20.75" $400. 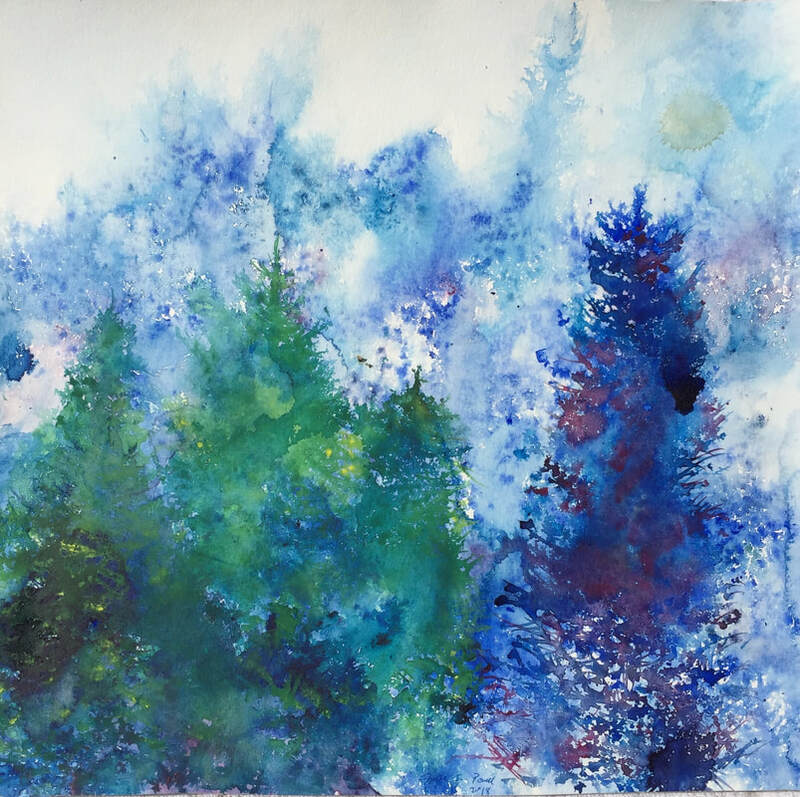 Forest Study in Blue #3 Watercolor 13.75"x20.5" $400. 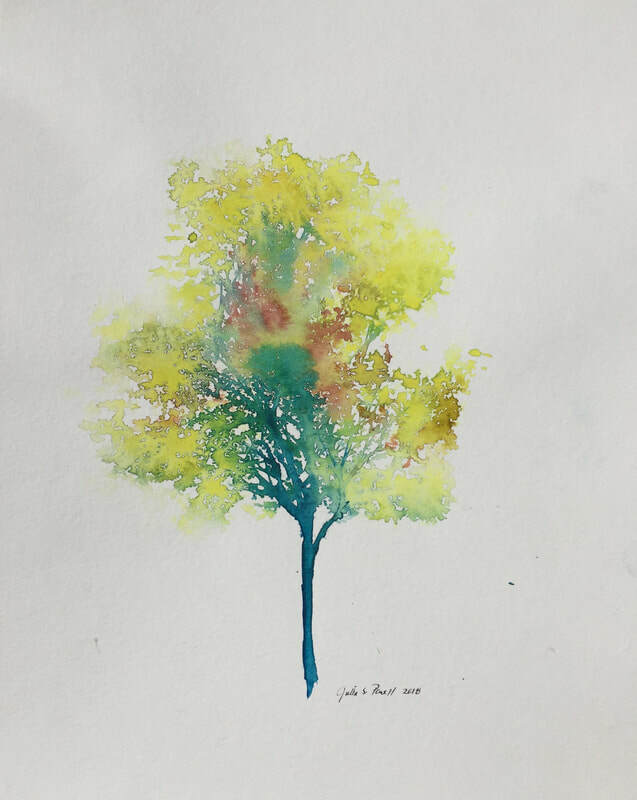 Turning Yellow, Solo Tree series Watercolor 12"x9" $500. Reflections in Green Watercolor 8.5"x17" $500. Self Portrait, 2019 Watercolor 12"x9" $500. 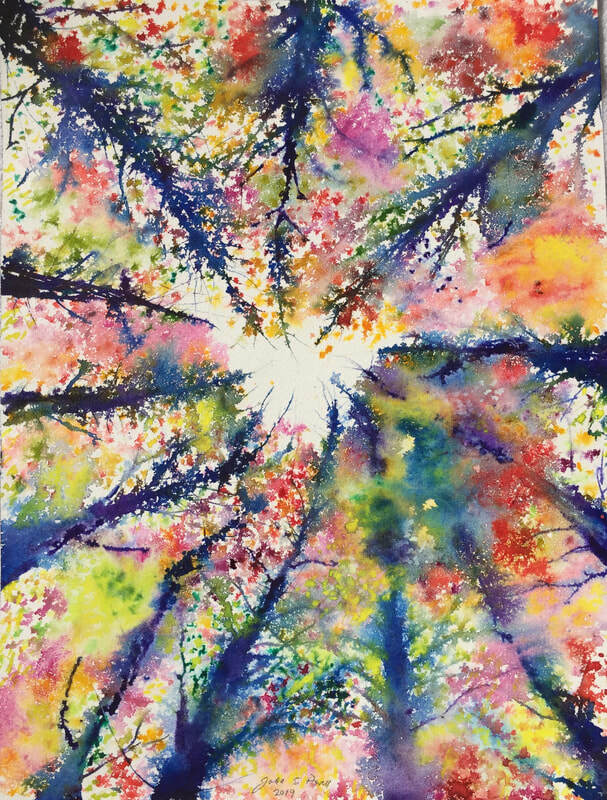 Looking Up series, Rainbow Roof #1 Watercolor 14.5"x12.125" $700. 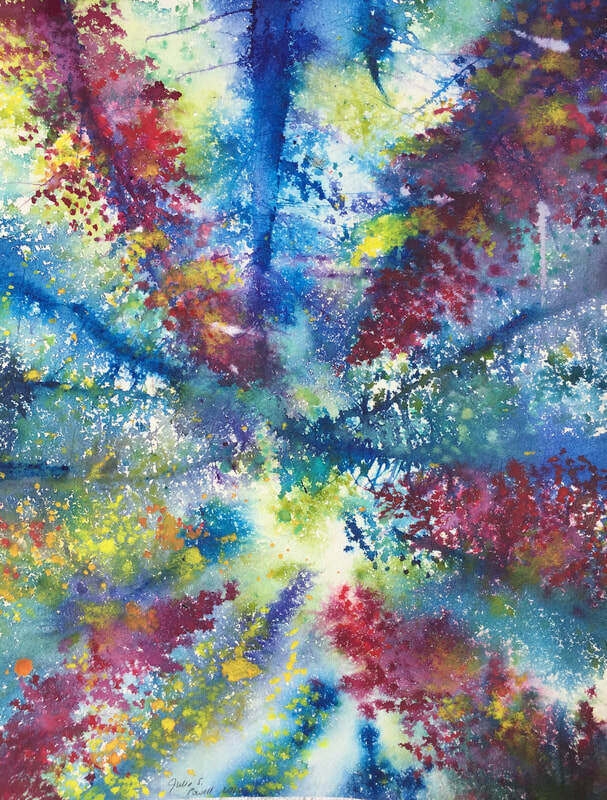 Looking Up series, Rainbow Roof #2 Watercolor 16"x12.125" $700. 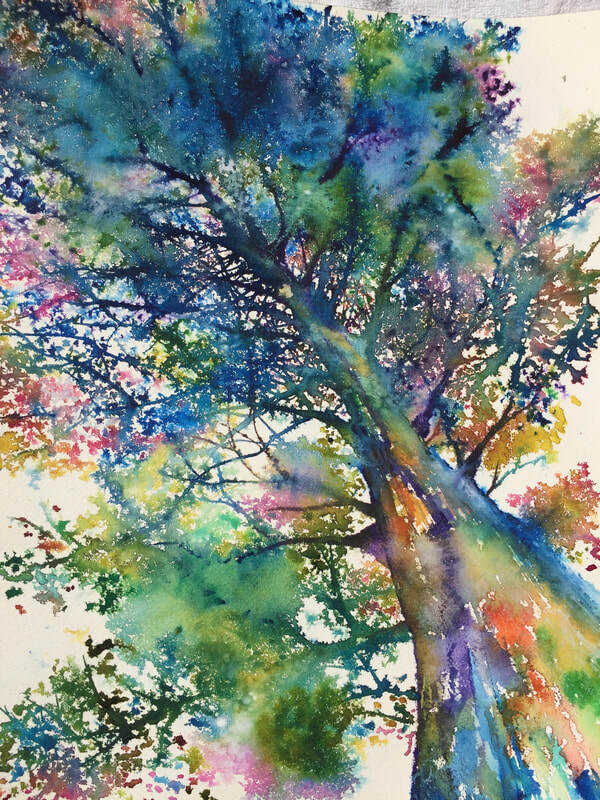 Looking Up series, Twin Trunks Watercolor 9"x12" $700. 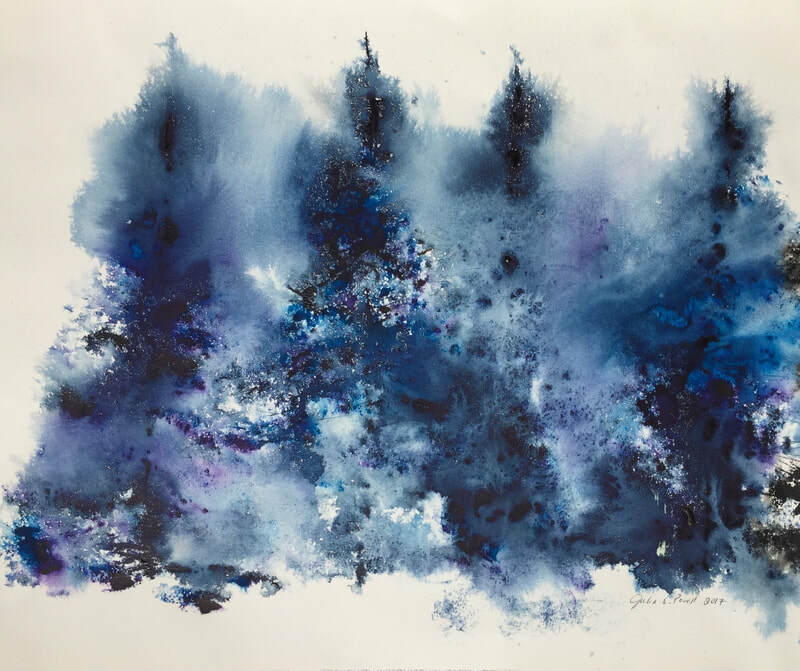 Looking Up series, Solo Tree Study in Blue Watercolor 16"x12.125" $900. 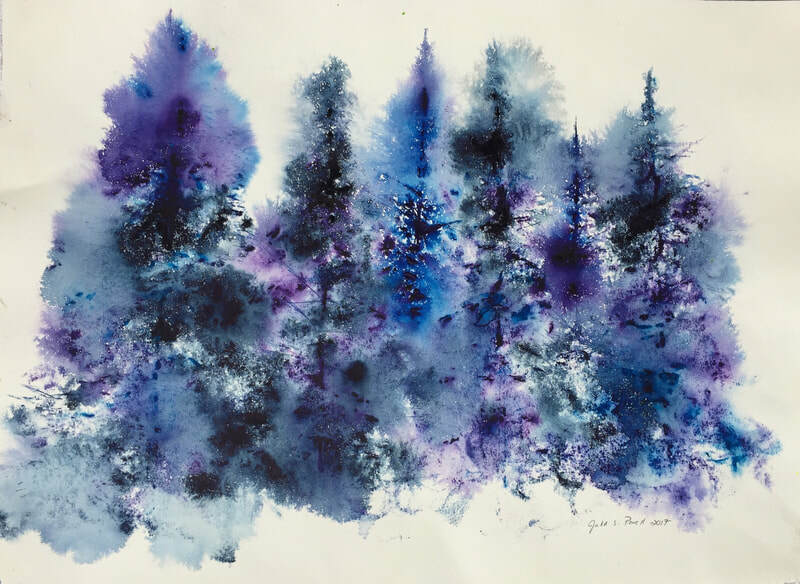 Stand of Purple Trees Watercolor 18"x20.875" $700. 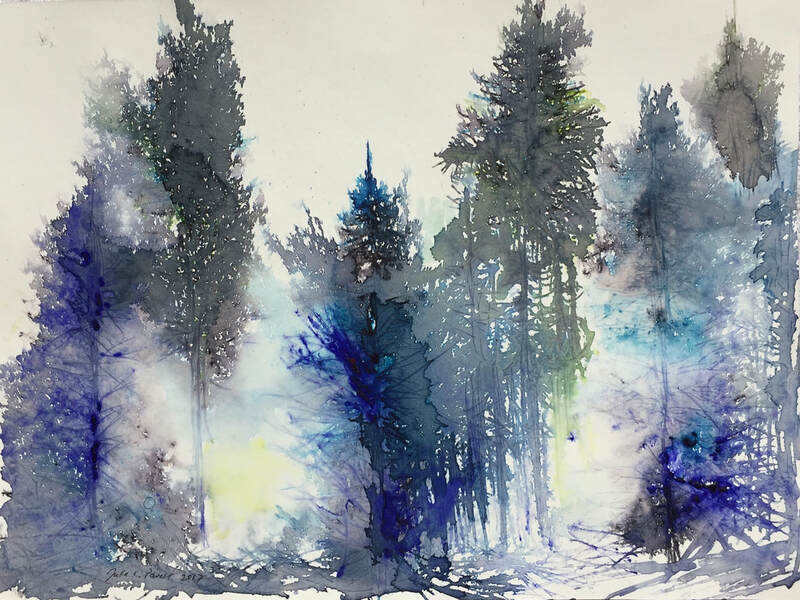 Stand of Pine Trees 2018 Watercolor 18"x24" $900. 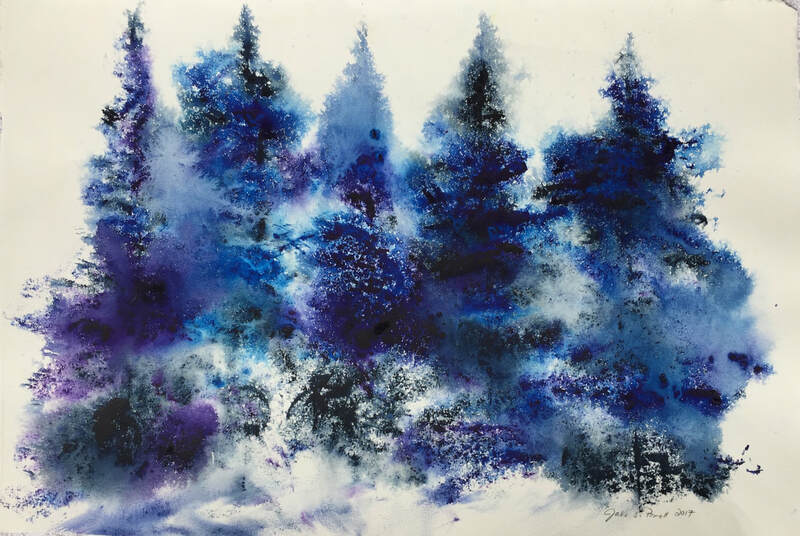 Sign up for Julia's newsletter to receive updates on new pieces, collaborations, upcoming exhibitions, and other exciting news.